Here’s our lovely Lee, modeling an exercise from a Restorative Reformer class. Larisa saw the class doing this exercise one day and ever since has been asking me to explain how I come up with some of the exercises I use in this type of class. 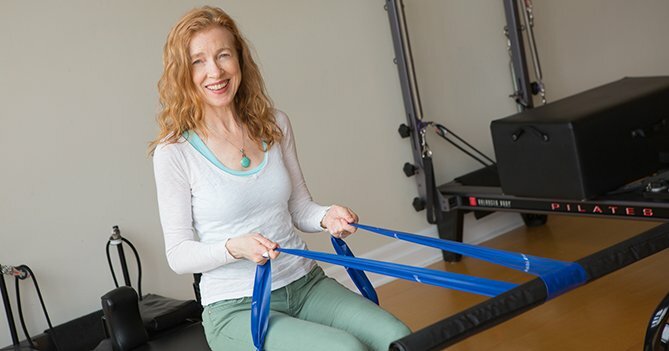 The majority of clients in these classes are mature women with various issues such as hip or knee replacements (sometimes both); shoulder issues such as frozen shoulder, rotator cuff injuries and arthritis; arthritis in a variety of other joints; back pain; osteoporosis, and general lack of fitness. Many of them have more than one of these issues at a time, making it an interesting challenge to come up with exercises that are possible and beneficial for everyone. They are all concerned about balance, as falls can be catastrophic for older adults. Even maintaining their balance while seated can become challenging for older clients, so the thought process that led me to the basic version of this exercise started with balance training. One of the exercise sequences in the Seniors on the Move workshop progresses through increasing challenges to balance by changing position, base of support, instability of surface and by adding perturbations (disturbances). Perturbations are easy enough when working one-on-one with clients as you can give them little nudges to test their ability to remain balanced. 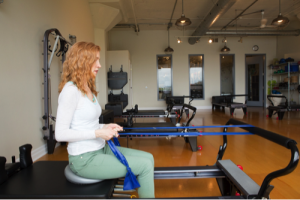 I wanted to use this concept in a group class, so one day I had my participants sit on Sitfits (balance cushions) on the side of their Reformer, facing a partner. Each held one end of a Theraband in each hand with their partner holding the opposite ends of the bands. Then they pulled on the bands in a see-saw motion at first, and then more erratically. The Sitfits made their balance surface unstable. I had them close their eyes and eventually had them sit back-to-back so they couldn’t anticipate the timing of their partner’s perturbations. The downside of this was needing an even number of clients in the class to make it work. I then came up with the idea of anchoring the band on the footbar of the Reformer and using the Sitfit and movement of the carriage (based on an exercise sequence Margot has used in the past) to provide the perturbations. Take off all the springs and slide the carriage out part way. Drape a Theraband around the foot bar so the ends are even and (optional) place a Sitfit at the foot bar end of the carriage (photo). 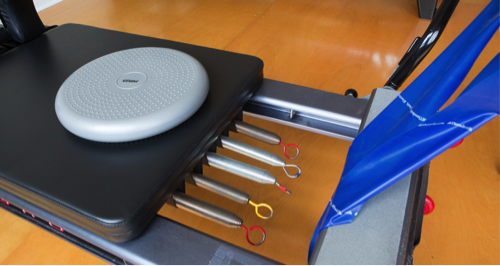 The client sits on the Sitfit facing the foot bar with their feet on the floor in the spring well (you can put a non-slip pad on the floor for traction and, if needed for clients with hip replacements, put yoga blocks under the Sitfit). 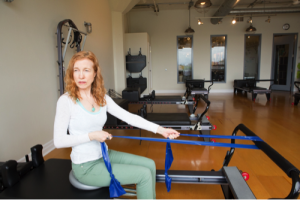 The client takes one end of the Theraband in each hand, elbows bent so that the upper arms hang at their side and forearms and hands are approximately parallel to the floor (like holding the reins of a horse carriage). The Theraband should be slack at this point. Start by having the client “walk” the carriage back as the resistance of the Theraband increases. Their objective is to stay upright on the sitfit and to keep their upper arm position unchanged (photo). 1. Hold the carriage out. Straighten their arms and then pull back to the bent elbow position while keeping the body still (photo). 2. Bend and straighten their arms while walking the carriage in and out. 3. Add rotation by pulling one bent elbow back while reaching the other arm straight and turning their torso in the direction of the pulling arm (photo). 4. Use the band for support while leaning back and returning to upright sitting (i.e., short box with flat back). 5. Keep both feet flat on the floor while bending and straightening knees. 6. Add a yellow spring for increased resistance. The main intended benefit of this exercise is increased core stability and proprioception to facilitate balance and upright posture in a seated position. With all the variations of this exercise, its benefits include increased ankle mobility, strengthening for quads and hamstrings at the knee, spinal mobility, and upper back, upper arm and grip strength. One unexpected upside of the original partner exercise was that several clients with shoulder issues reported their shoulder pain was much reduced after this exercise. My theory is the almost passive movement and resistance of movement provided by the partner and the band activated the entire rotator cuff without taking their shoulders into painful, aggravating ranges of motion. 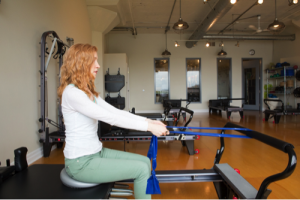 Preventing shoulder motion against the increasing resistance of the Theraband as the carriage moves back provides an isometric rotator cuff activation. Each participant can choose to stop with a variation that doesn’t irritate their shoulders. I steal unrepentantly from things I see other teachers do. I experiment with different ways to achieve the benefit of exercises which were intended to be performed in other situations and with different pieces of equipment. I take advantage of unexpected “bonus” results like the reduced shoulder pain mentioned above. When I read or hear about something new to me, I unashamedly use myself and my clients as guinea pigs to figure out how an exercise works for different body types and physical issues, and how to modify it to suit as many different people as possible. How do you modify your exercises for clients with different challenges? If you don’t modify exercises yet, what do you want to try first? Let us know in the comments below! 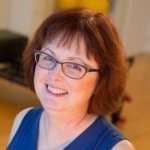 Her own diagnosis of osteopenia (the precursor to osteoporosis) sparked her interest in adapting Pilates for clients with physical issues. Great article! Thanks for sharing! I too love to steal from other teachers. It keeps it new and interesting and helps me to come up with new ideas! Thanks for sharing, will be using in my sessions. Love all the articles, tips etc really enjoy this site. I loved taking your Strong Bones classes during my training there at Body Harmonics. I love your creativity, gentleness, and yet strength of exercises you do with those class participants. I teach seniors either privately or in group classes and am always looking for new ideas to “steal” from other teachers. Some exercises or cues work differently with each person so I find variety is important. Sometimes the equipment or small apparatus can overwhelm their minds which leads me to the KISS method. Thank you to Body Harmonics for posting these articles.